The often strained relationship between the media and national security institutions such as the military is as old as the foundations of the modern state, and African countries are no exception. The reason typically cited is that, like most bureaucracies, the security services prefer to operate behind closed doors—a preference heightened by the need to prevent potential enemies from learning harmful information. The press, n the other hand, responds to citizens’ demand for information and accountability, especially in the case of institutions as powerful and potentially dangerous as the security services. The Africa Center for Strategic Studies and its Liberia Community Chapter, in conjunction with the United States Embassy discussed these issues at the Topical Outreach Program Series (TOPS) symposium, in Monrovia, Liberia, March 2–7, 2014. 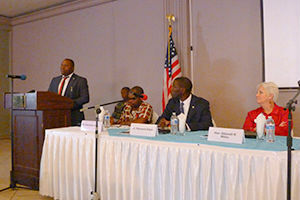 The symposium brought together Africa Center community members, public affairs officers from Liberian security sector agencies, editorial staff and reporters from various news organizations in Monrovia, and U.S. Embassy staff. Prof. Thomas Dempsey, the Africa Center Chair for National Security Studies and a formerly U.S. military attaché in Liberia, explained that the relationship between the media and security sector requires careful and constant balancing. “This delicate relationship is a domain in public affairs that always needs to be negotiated and defined in a constructive way as part of the wider effort to implement institutional and political reforms, especially in the Liberian context,” he told participants. “One of the most important lessons from this experience is that security sector reform, as well as the management of national security in general, should be an integral part of the broader processes and philosophy of political, social and institutional change,” he continued. Prof. Dempsey in his remarks also stressed the need for media and national security professionals to understand each other’s culture and roles in order to improve their relationship. Because the press is generally more fragmented, competitive and diverse, it can be unaware of larger security sector reform realities, he said. The military and other members of the security sector, on the other hand, tend to view the media as intrusive, irresponsible, and unaware of how security professionals operate. In extreme cases, security professionals might even view media professionals as threats to national security. “The Liberian model shows that the relationship, although tense, can be managed in healthy and constructive ways that stay true to the new principles that Liberians have fashioned to take their country forward after so much strife,” Prof. Dempsey concluded. Mr. James Momoh, a media consultant and Africa Center Adjunct Faculty member, highlighted the media’s role in security sector reform. “Media professionals have a responsibility to familiarize themselves with the democratic principles that Liberia is trying to apply and advocate for these in not only dealing with the security sector but larger issues as well,” he counselled. Mr. Momoh also stressed the importance of professionalism. Both assumptions, in Mr. Momoh’s view, undermine the process of nation-building in Africa. He argued that the media, as well as broader civil society, must apply democratic values and use democratic methods in their activities. Governments on the other hand should be aware that the concepts of human rights, human dignity, and democracy are intrinsic to African culture and aspirations. “How else can we explain the fact that African countries, on their own initiative, crafted the African Charter on Human and Peoples Rights, New Partnership for African Development and the African Conference on Democracy, Elections and Good Governance?” he asked. “What is needed therefore is a shift in attitude, both by media professionals and civil society as a whole, and the government and Liberians seem to be on the right track in as far as this is concerned,” Mr. Momoh concluded. First, the institutional cultures of the security sector and media, need not be in conflict. Second, security sector reform should be part of the broader reform agenda and not isolated. Third, Liberia’s post-conflict environment provides abundant opportunities to test and debate perspectives in ways that were not possible before the war. Fourth, there is need to promote greater debate on national security issues within civil society. Fifth, it is imperative that the security sector establishes a solid working relationship with the media, that it integrates them into its strategy – and that it not keep media professionals at arm’s length.